In our collaboration with the Northeast Ohio Regional Sewer District, TV20 has had the opportunity to visit a few of the plants and treatment centers that service the Greater Cleveland area for the show Clean Water Works. 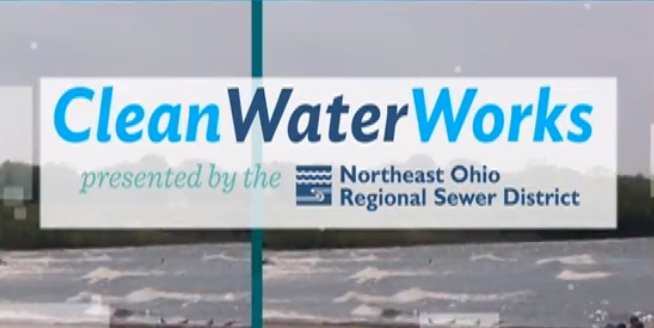 Clean Water Works is a monthly newsletter produced by the Northeast Ohio Regional Sewer District and TV20. Clean Water Works aims to inform and educate customers and residents on what it takes to maintain and operate clean flowing water in Northeast Ohio. Today, we want to bring you with us! Time to go behind the scenes on the upcoming episode of Clean Water Works. This month’s episode took us to the Easterly Sewage Treatment Works, located right at the shore of Lake Erie. The first stop of our visit was to the Blower Building, one of the many primary facilities at the Easterly Works. Five “De Laval” steam turbines occupied the inside of the Blower Building. They power much of the plant, and more importantly, the tanks and basins outside. The walls were lined with a number of intricate panels and instruments which measured the current state of facility. Clean Water Works host, Ray Weeden, interviewed John Boyd, a maintenance mechanic at the Easterly Plant & a recent graduate of the Maintenance Training Program. For their sign off, Ray Weeden was joined by his cohost, Jennifer Elting outside by the settling tanks. Stay tuned to TV20 and catch the upcoming episode of Clean Water Works!